Are you a fan of coastal villages? Do you like sea life and typical houses on the beach? Do you want to spend a fishing vacation enjoying all the tranquility you can imagine? Then do not hesitate to visit the Basque Country! We will show you some of the most beautiful corners you will find. Where to go in Basque Country? It has been a bit difficult to make a selection with the most beautiful of the Basque Country. Everything is impressive! In addition to the landscapes worthy of thousands of photographs, on the Cantabrian Coast you can enjoy its famous gastronomy with well-prepared dishes. All this town bordering France and near the Bidasoa River is beautiful. It is an ancient walled city where its cobbled streets will make you want to get lost. You do not want to look at the map! Its castle, now Parador, located in the Plaza de Armas is one of its most representative attractions. To the east of Hondarribia is the Txingudi Bay. You can take a boat and cross to French lands in a matter of minutes. The Marina district is another place worth visiting, the fishermen’s houses are very beautiful because all their balconies are adorned with flowers. Zurriola is the beach best known of the capital of the Basque Country and worth laying to rest on it. Its great waves have made it a must for surfers. If you look in the opposite direction to the sea you can see the silhouette of the Congress Hall and Kursaal Auditorium, where every year the San Sebastian Film Festival is celebrated. As you walk around, take a walk around the Bay of La Concha, the most urban beach in the area. In addition to being in a privileged location, next to the historic center, it is striking its semicircular shape and that its climate is pleasant all year round. Do you still want more of San Sebastian? Of course, you will! At the end of the beach of Ondarreta stands the Peine del Viento, a great sculptural-monumental work by Eduardo Chillida and Peña Gantxegi. The three pieces that compose it are arranged in different boulders right on the edge of a cliff. It is lovely to see how the waves break on it! If you are going to visit the Costa de Bizkaia, Bermeo is without a doubt a must stop. Surely you have seen the famous hermitage on top of a cliff, typical postcard of the Basque Country. Well, now you know where it is located, very close to San Juan de Gaztelugatxe. It has become more popular since Anne Igartiburu decided to marry in this place. What a choice! During your stay in Bermeo, 30 minutes from Bilbao, you can take a walk through its marina and above all taste some of the typical dishes in the bars of the pier. Between Deba and Zumaia is this large coastal park, of the most beautiful corners of the Gipuzkoan area. It is an incredible place for lovers of geology because they will know the history of some cliffs. 60 million years! A beautiful landscape where you can see it, the panoramas are amazing. You can start your journey from Itzurun beach and the hermitage of San Telmo. Do you want to observe something unique in the world? 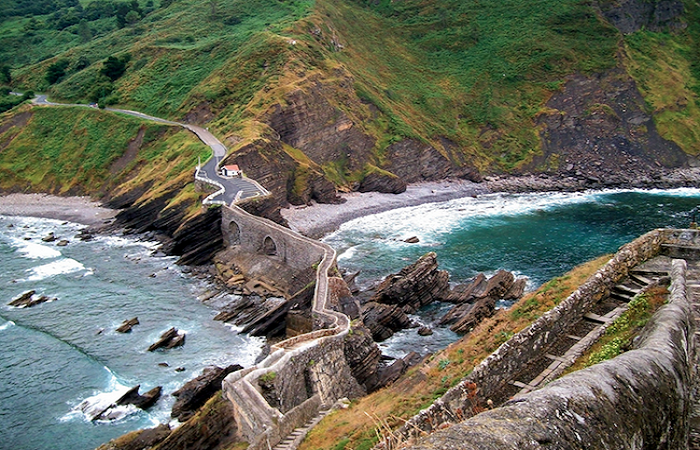 Then visit this Basque geopark! You will fall in love with this town at first sight. Of fishing origin and with an old town of the most beautiful, you will never want to leave from there. Among the main attractions of Lekeito are the Basilica of the Assumption of Santa Maria and of course the area of the port where you can find modern and traditional boats as well as the casitas of the shore. Looking for a place to dive? You have two! The beaches Isuntza and Karraspio. If the tide is somewhat low, you can go for a walk on the Island of San Nicolás. Pay close attention to the low tide and especially when the tide begins to rise!